This manuscript contains the commentaries on the Dhammapada “The Verses of Truth” attributed to Buddhaghosa (5th century), the greatest Buddhist commentator in Pali, along with a paraphrase in Burmese. It consists of a sheaf of 484 ollas protected by two 2 cm.-thick boards each pierced with a hole. The boards are made of black lacquered wood and display floral motifs. 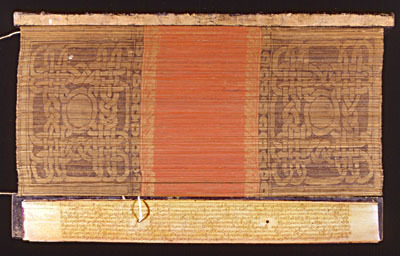 Each page carries a 9-line text of medium round Burmese calligraphy carved into the leaves and has two empty rectangles with pierced holes holes to thread the pages together. The foliation, on the top left margin on the back of each page, adopts an alphabetical system; moreover, the mention Dhammapada appears in tiny characters in the right-hand margins of certain ollas. The magnificent black lacquered borders, of an outstanding quality of craftsmanship, have gilded edges and a broad red lacquered band in the middle flanked by a broad interlacing motif that differs on each border. The ollas are made from talipat palm (corypha umbraculifera) leaves. The style of the boards and the undivided sheaves allow the work to dated from the latter half of the 18th century. No copy of the text exists in any French library; only Copenhagen library possesses a related manuscript with which it is possible to establish links, although the latter text is different and incomplete.